These testimonies, reflecting two sides of the same urgent issue, are part of an extensive study I conducted over the past year in which I gathered opinions on the status of Micronesian students in Honolulu’s public schools. The study was set amid a growing sense of urgency in Honolulu. Citizens of the Federated States of Micronesia (FSM) have protected status with the United States (U.S.) under the Compact of Free Association (COFA). In exchange for the U.S. to use Micronesian land, air, and seas for U.S. military purposes, the COFA permits Micronesian citizens to freely migrate to the U.S. without a visa and entitles COFA migrants to public services. An estimated 107,000 COFA migrants currently reside in the state of Hawaii, 75,000 of which are from the FSM. As the number of COFA migrants to Honolulu has increased, so also have the intensity of public discourses around education, health care, and affordable housing. Micronesians come to Honolulu with the hope of a better life for their children and for themselves. They dream of a good education, adequate health care, and the possibility of finding a job. Upon arrival in Honolulu, however, Micronesians face discrimination, lack of affordable housing, a politically charged healthcare environment, and a contentious—rather than secure—place in the public education system. It is widely believed that Micronesian students in Honolulu are not doing well in school. To the schools, it means that students do not attend school and do not progress through the system to eventually graduate. Schools talk about absenteeism and relate that to low achievement. 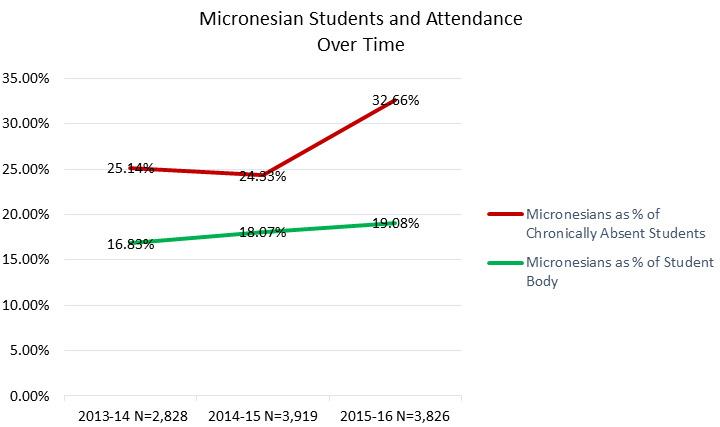 Indeed, Micronesians make up the largest percentage of students designated as chronically absent, a rate of absenteeism has been increasing (Figure 1). Schools blame absenteeism and drop-out rates on lack of parental involvement which, to them, indicates that Micronesians do not value education. Meanwhile, parents of Micronesian students contend that their children are not able to reach their full potential in public schools. Parents say that their children are labeled as incompetent and trapped by the English Language Learner (ELL) designation. Most Micronesians in Honolulu are from the state of Chuuk, identify as culturally Chuukese, and speak Chuukese languages. Many parents blame the schools for cultural and linguistic discrimination that prevents their children from benefiting fully from Honolulu’s schools. Parents believe these and other factors cause Micronesian students to be “pushed out” from the public school system. Stakeholders who have an interest in improving education for Micronesian students recognize that the current approach to educating these students is not achieving the desired results. All agree that they want Micronesian students to be successful in school—but there are gaps in perceptions of the challenges (Table 1). How can stakeholders move beyond their narrow perspectives and work cooperatively for effective change that will benefit the Micronesian student population? My research into this issue sought to give voice to teachers and principals, as well parents and community leaders, regarding expectations and the issues hindering Micronesian student engagement. In particular, the study aimed to capture the perceptions of teachers and principals directly involved in the public education of Micronesian students. To that end, between June 2015 and February 2016, I interviewed 57 community leaders, service providers, government representatives, teachers, principals, and parents. Participants shared opinions of feasible solutions to problems related to language and intercultural understanding. Some of the solutions suggested may contribute to viable long-term solutions to the problems of chronic absenteeism and high drop-out rates for this population. I also analyzed student demographic and attendance data from 4 target schools with an average of 30% Micronesian student population to probe relationships between ethnicity and attendance patterns. Overall, my research exposed widespread finger-pointing; the challenges of educating Micronesian students are blamed on others. To encourage positive movement toward cooperative problem-solving, I suggest that stakeholders first engage in conflict resolution-style relationship building. Further recommendations to begin to address student achievement include many that teachers themselves suggested in interviews (Table 2). My next step will be to circulate these findings and recommendations to policymakers, community leaders, community organizations, and other relevant stakeholders in Honolulu—to help raise awareness among stakeholders about the expectations each group has of others and the perceptions of the issues that affect Micronesian students. Future steps include the possibility of establishing a new collaborative platform for all community members and stakeholders to communicate, work together effectively, and take concrete action to enhance Micronesian students’ success in the education system. 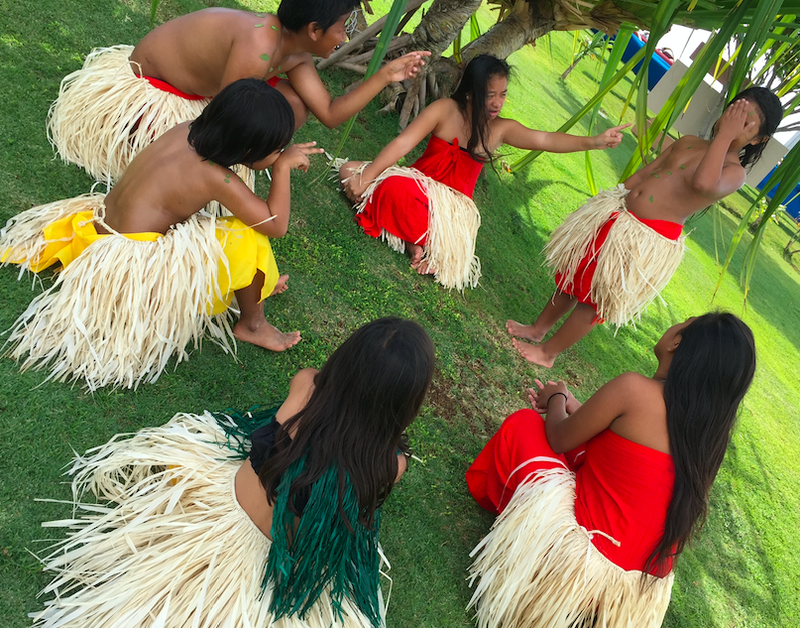 In the words of one community leader, “I think that the kids are very bright, but they’re not given a chance to really fly.” When stakeholders work together to improve the way Micronesian students experience education in Honolulu, Micronesian students will shine. Sheila Matsuda is a graduate of Teachers College, Columbia University and an expert in intercultural communication and Japanese language and culture. You may reach her at sheila.walters.matsuda@gmail.com to request the full policy briefing. No Replies to "DROP-OUT OR PUSH-OUT? MICRONESIAN STUDENTS IN HONOLULU"